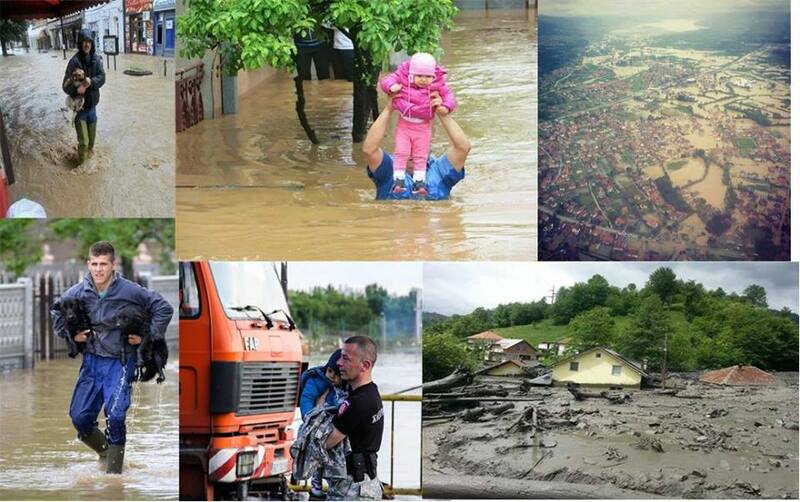 During the last two weeks the Republic of Serbia has been struggling with the worst floods that have ever been recorded in our history. This natural disaster claimed tens of human lives, flooded towns and villages, destroyed arable lands, harmed economy, and caused inestimable damage. Thousands of homes, schools, businesses, bridges, roads and railways were washed out by the flooding. A vast number of landslides worsened the situation, sweeping away almost whole villages. The country has been devastated. It is assumed that material damages from the flooding will exceed one billion euros. In rebuilding the country we will have to rely on aid from abroad, because the damage to infrastructure, industry and agriculture is so severe that we can not do it alone. Serbia needs imediate assistance and that`s why we are calling everyone who is able to help to do that. Even the smallest donation means a lot to those who lost everything they had. In the following tekst you will find all information about collecting the humanitarian aid in the Netherlands – financial donations, donations in goods, packing, transport, customs etc. We would like to point out that financial donations are the fastest and the most efficient type of assistance at this moment. 1. The Embassy of the Republic of Serbia in The Hague has opened a special account in the Netherlands for financial donations to flood victims in the Republic of Serbia. This will allow everyone to deposit money without paying fees for international transfer of money, because the Embassy will transfer those funds, free of charge, directly to the the account of the Serbian Government opened for this purpose. 1a. It`s possible to make a financial donation in cash as well in the Embassy of The Republic of Serbia in The Hague. 2. Those who would like to place donations directly to the account of the Government of the Republic of Serbia opened for this purpose, can find all relevant information HERE. 4. We would like to inform you that the Dutch Red Cross has opened a special bank account No 6251 for financial donations for flood victims in the Republic of Serbia and Bosnia and Herzegovina. 5. The Dutch Red Cross has opened the charity number 4333. Each SMS sent to this number has a value of 2 euros and those funds are dedicated for flood victims in Serbia and Bosnia and Herzegovina. 1. Embassy of the Republic of Serbia in The Hague, Burgemeester van Karnebeeklaan 19, 2585 BA Den Haag, tel. 070 36 32 302. We are proud to announce that more than 12 tons of humanitarian aid have already been collected in the Embassy and sent to the Republic of Serbia by airplanes of the airline company "Air Serbia", which joined the humanitarian action by providing free transport to our country. Since, in accordance with the instructions of the airline company, all goods must be sorted and packed in the appropriate cardboard boxes, with the specification of the aid on it (food, water, toiletries etc. ), we appeal to everyone to sort and pack them in this manner. Detailed instructions are given below (see Transport by “Air Serbia” airplanes). We draw your attention to the appeal of the Red Cross of Serbia not to send clothing anymore, due to other priority needs and due to the amount of clothing that is currently available (there is no more room in the storage space of the Red Cross at the moment). Please keep this in mind if you want to make donation. We will appreciate any assistance of yours – helping us with packing and bringing solid cardboard boxes. Those who are ready to help, please contact us on 070 36 32 302. The Ministry of Health informs that, in order to protect the health of the patients, donations of medicines and medical devices directly from individuals can not be accepted, since it is not known how the medicines were purchased and in what conditions they were kept. All individuals and legal entities who wish to donate medicines and medical devices that are registered in the Republic of Serbia can donate through the manufacturer or wholesale to the Central Pharmacy of the Clinical Center of Serbia, in charge for further distribution. In the case of donations of non-registered medicines, the approval of the Medicines and Medical Devices Agency of Serbia will be needed for the import. List of essential medicines, as well as relevant information in this matter can be found in the Instructions for potential donors of medicines and medical devices released by this Ministry. Thanks to the kind assistance of Dutch doctors, friends of the Embassy, we`ve been able to provide you with the list of the medicins that correspond to serbian ones (on the above mentioned list) but can be purchased in the Netherlands - the list of medicines availibale in the Dutch pharmacies. All those who are able to provide donations of medicines through manufacturers and wholesale have to obtain a specification that contains the generic name and the brand name of the medicine, pharmaceutical form, strength or concentration, country of origin, manufacturer, exact amounts and dates of expire (medicines that will expire in less than 6 months are not accepted). In that way the competent authorities of the Republic of Serbia can determine whether a particular medicine is registered in the Republic of Serbia or not, and which procedure for the import of the medicines will be followed. Concerning the medical devices, you have to provide their exact names and names of manufacturers. Any additional information can be found in the above instructions of the Ministry of Health. Customs of the Republic of Serbia has taken all necessary measures to simplify the procedures and to prevent the retention of humanitarian aid. In order to speed up the procedure , it is necessary to make detailed specification of the goods being transported. This will facilitate the application process at border crossings, as well as identifying the goods that need the consent of some inspective service. It is neccessary to put on the specification the name of the sender and the name of the reciever of the humanitarian aid, in order to speed up the processing of customs documents that enables transfer of the goods directly from the border crossing to the final destination. If there is no data on the goods, they will be sent to the customs terminal in Belgrade. More information can be found on the website of the Customs Administration. For each transport The Embassy of the Republic of Serbia in The Hague will issue a certificate for the transport of humanitarian aid, that the carriers need to present to the customs authorities in order to be given the priority and to speed up customs procedures. In order to facilitate customs procedures, as soon as the Embassy gets the notification from the donors about the exact departure of humanitarian aid from the Netherlands, the Embassy will inform the competent authorities of the Republic of Serbia on the following details: sender, recipient, type, quantity, value, type of vehicle and aprroximate place and time of the crossing of the border, in order to provide the priority and to speed up customs procedures. Donations in the form of providing transport of donated goods to Serbia are also very much needed and welcomed. Customs of the Republic of Serbia informed that humanitarian aid should be sent to the customs offices of the Republic of Serbia authorised for the trade (for example, in the case of the Customs Subotica authorised crossing border is Horgos (Kelebija doesn`t provide phytosanitary services). More information can be found at web site of the Customs Administration. The competent authorities of the Republic of Croatia informed that all shipments of humanitarian aid to Serbia and Bosnia have priority. Shipmens with destination to Serbia should be referred to the border crossing Bajakovo, because it is 24 hours open for transport of all kinds of goods and it has all needed inspection services (shipments for Bosnia and Herzegovina should be sent to the border crossing Stara Gradiška). Тhey appeal that the embassies should announce the arrival of humanitarian aid. Ministry of Construction, Transport and Infrastructure of the Republic of Serbia has informed that all trucks/lorries that transport humanitarian aid to flooded areas are excluded from the regime of multilateral and bilateral permits and will pass without international permits and according to the accelerated procedures. Public enterprise "Roads of Serbia" has made the decision that the vehicles carrying humanitarian aid to Serbia are exempt from paying tolls on motorways in the Republic of Serbia, if they present a certificate for the transport of humanitarian aid issued by the Embassy of the Republic of Serbia at the toll booths. Croatian Motorways also exempted vehicles carrying humanitarian aid to the affected areas in Croatia, Bosnia and Serbia from paying tolls. Due to the records of evidence of free passes, it is necessary to submit the name of the organization or name, registration number and type of vehicles, as well as information on entry and exit toll on email: info@hac-onc.hr. The airline company "Air Serbia" joined the humanitarian action by providing free transport of humanitarian aid to our country. For the transport of humanitarian aid in this way, it is necessary to get in touch with the Embassy of the Republic of Serbia in The Hague. a) The shipment must not contain any hazardous materials neither perishable food (batteries and electronic devices that contain batteries can not be transported in this way, as well as disinfectants or products containing alcohol, acetone and other hazardous substances and products that are under the pressure. b) The cardboard boxes should be strong enough, the maximum dimensions of each box are 120x100x110 cm and maximum weight 150 kg. It has been suggested to pack in the smaller boxes so that more aid can be packaged into a plane . c) Each box has to be labeled with Humanitarian Aid Serbia + sender + recipient (Serbian Red Cross or the Ministry of Health of Serbia in the case of medicines). d) Each box should have label with the: number of the general specification/2014-number of box (eg. first box carries 1/2014-1 , another box 1/2014-2 etc.) + type of aid (food, water etc. – different types of aid should not be mixed together) + estimated value + amount (how many pieces, packages or weight). HERE you can download, print and seal up the labels mentionned above . e) Entire shipment should be accompanied by a general specification in two copies (detailed list of items with the number of boxes and the estimated value (see information about the specification and cerificate above). Bearing in mind that the labels on the boxes should be in the English language, the general specification submitted to the Dutch customs should be in English as well. f) Based on the above mentioned specifications, the Embassy will issue a certificate for the transport of the humanitarian aid, which sholud be handed over (along with the specification) at the airport Schiphol. 2. HERE you can download the list of retailers and importers of baby equipment and food, as well as pharmacies, if you want to purchase this type of humanitarian aid on the market of the Republic of Serbia . All information on the web site of the Embassy has been updated regularly, in accordance with the official information received from the relevant authorities of the Republic of Serbia. The Embassy of the Republic of Serbia warmly thanks all the citizens of Serbia and the Netherlands, as well as all other friends of Serbia who have been demonstrating solidarity and humanity in this difficult situation. Serviё is overtroffen met de zwaarste ovestromingen ooit, die te vergelijken zijn met de Nederlandse watersnood ramp uit recente geschidenis. Volgens de berichtgeving uit Serviё tot nu toe is 30.873 personen geёvacueerd, waarvan uit Obrenovac (stadje 30 km van Belgrado) 13.603 waar de situatie is ergste tot nu toe, volgens de Ministerie van Binnenlandse zaken Serviё. Hierbij willen we u informeren over de grote inzamelingsactie van de humantaire hulp aan de slachtoffers van de overstromingen in Serviё. 1. Ambassade van Republiek Serviё opent een aparte rekening in Nederland voor de financielle bijdragen met de doel om alle individuele betalingen vrij te stellen van transfer kosten voor de transacties buiten EU en deze betalingen zullen rechtstreeks doorgestuurd worden naar de rekening van de Regering van Republiek Serviё. 2. Voor degene die een financielle bijdrage direct willen doen via de rekening van de Regering van Republiek Serviё. Volg de instructies voor de betalingen. 3. De betalingen voor de humanitaire hulp zijn ook mogelijk via Pay Pal service, van diplomatieke vertegenwoordiging van Serviё in Brussel. Alle betalingen via deze rekening worden rechtstreeks doorgestuurd na da rekening van Regering van Republiek Serviё voor de hulp aan de slachtoffers van de overstromingen. Zie hier. 4. Nederlandse Rode Kruis opent de giro 6251 voor de slachtoffers overstromingen Serviё en Bosniё. 1. Ambassade van Republiek Serviё in Den Haag, Burgemeester van Karnebeeklaan 19, 2585 BA Den Haag, tel: 070 – 3632 302. 2. St. Nicola kerk in Zaandam, Stationsstraat 13, 1506 DA Zaandam, iedere werkdag van 18:00 tot 22:00 uur en zondag van 10:00 tot 20:00 uur; Tel: 06-54681310 (Rada Lazic). 4. Parohie St. Sava in Nijmegen, Dobbelmannweg 3, 6531 KT Nijmegen; ieder werkdag vanaf 14:00 tot 18:00; Tel: 0645282618 (Goran Zivkovic). 6. Breda - SiDra vof Goeseelsstraat 9, 4817 MV Breda; Tel: 06-34766407 (Eva Kovačević – Ilinčić) en 06-28882336 (Jelena Vasilić-Milisavljević). We stellen voor om alle nodige goederen op juiste soort te sorteren. Ministerie van Gezondheid van Serviё stelt voor dat giften en donacies in medicijnen en medische goderen die individueel worden gebracht worden niet geaccepteerd vanwege de ondudelijkheid van hun oorsprong en manier van bewaren. Alle rechtspersoonen en publieke organen die willen medicijenen of andere nodige medische goederen geregistreerd in Republiek Serviё doneren, kunnen via de groothandels of fabrikanten donaties doen aan de Centrale Apotheek van de Klinisch Centrum Serviё, die verder doet de distributie van de humanitaire goederen. Indien is er sprake van niet geregistreerde medicijnen voor de invoer van deze donaties is er een vergunning van de Agentschap voor de medicijenen en medische goderen Serviё nodig. Alle info en de lijst van de nodige goederen kunt u vinden in de Instructie voor de potentiёle donateurs van medicijnen, medische en andere goederen van Ministerie van Gezondheid Serviё. Ambassade van Republiek Serviё zal de certificaten voor de transport van de humanitaire hulp naar Serviё verlenen zodat de vervoerders kunnen dat aan de douane presenteren voor de snelle grensovergang. Servische Douane heeft alle maatregelen genomen om onnodige vertraging van humanitaire hulp te voorkomen, heeft het procedure maximaal vereenvoudigd. Vanwege een snelle procedure is er een gedetaillerde specificatie van goederen nodig. Dat vereenvoudigt de aanmeldingsprocedure aan de grensovergangen, maar ook identificatie van de goederen waarvoor is een toestemming van bepaalde inspectie verreist. Op de specificatie is noodzaakelijk te melden wie is de zender en wie is de ontvanger van de humanitaire hulp, wat heeft als gevolg dat Douane rechtstreeks de goederen naar de plaats van de bestemming stuurt. Indien deze gegevens ontbreken, deze goederen zullen gestuurd worden naar de Teminaal van de Douane in Belgrado. Meer daarover op de website van Servische Douane. Overheidsbedrijf “Putevi Srbije” heeft besluit genomen dat alle voertuigen die humanitaire hulp vervoeren zijn vrijgesteld van tolheffingen op de Servische autosnelwegen onder de voorwaarde dat ze in bezit zijn van een certificaat van Diplomatiek-consulaire vertegenwoordiging van Republiek Servie over de humanitaire hulpgoederen. Humanitaire zendingen dient gestuurd te zijne naar de grens posten van Republiek Servie die bevoegd zijn voor de handel (bv. voor Douane in Subotica bevoegd zijn grensposten Horgos en Kelebija. Meer info daarover op de website van Douane Servie. Luchtvaarmaatschappij Air Serbia heeft de reguliere vluchten ter beschikking gesteld aan de Rode Kruis van Serviё en Ministerie van Buitenlandse zaken Serviё voor de transport van noodhulp goederen van uit buitenland naar Republiek Serviё. Voor de transport van de ingezamelde humanitaire hulp dient u contact op te nemen met de Ambassade van Republiek Serviё in Den Haag. Zendingen mogen geen gevaarlijke stoffen of voedsel die kan bederven bevatten (accu baterijen en elektroniche apparaten die acuus gebruiken kunnen niet op deze manier gezonden worden, noch ontsmettingsmiddelen op basis van alchohol, aceton en andere schadelijke stoffen of die onder de druk staan). Dozen moeten van de volgende dimenzies zijn: 120x100x110cm en niet zwaarder dan 150 kg. Bij voorkeur kleinere dozen om makkelijker en meer ladingen te kunnen maken. Belangrijk! Voordat u met de zendigen begint graag contact opnemen met de Ambassade. Ambassade van Republiek Serviё met regelmaat bijwerkt alle info dat ze officiёel ontvangt van autoriteiten van Republiek Serviё. Hartelijk dank aan alle burgers van Serviё en Nederland die hebben zich solidair en humanitair opgesteld in deze moeilijke situatie.